The evolution of the Internet has created immense change in the lives of individuals. Massive amounts of information are a click away. People have the ability to interact and communicate with an unlimited audience and people all over the globe are connected through their social interactions. Distance or isolation can no longer hinder a person’s ability to communicate, learn, or interact. The weblog phenomenon has provided people with the unique opportunity to reach other and create change. Through video blogs, people can interact and connect with others. 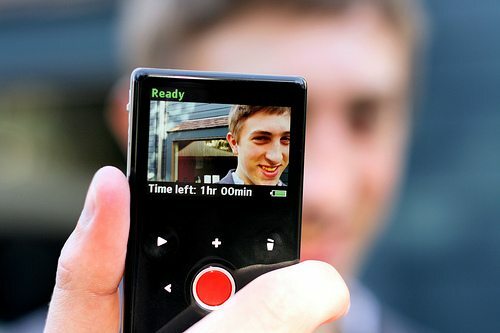 Video blogs consist of an individual making a video and then posting it online. Anything and everything can be included in these videos. People make them for many different reasons. These blogs have a powerful effect on audiences because of its informal and personal technique. Apart from personally talking to an individual, video blogs are the most effective way to connect with a person. An extremely successful example of this type of marketing technique is the “It Gets Better” project. The “It Gets Better” project is an extremely unique endeavor because it creates an entirely new genre for video blogs. According to Peter Medway’s article, “The criteria of generic membership, according to this view, require that a text should address a particular type of “exigence”- that is, a situation that calls for action in order to change or maintain it- and that is should arise from a particular socially recognizable motivation” (Medway 124). The “It Gets Better” project demands a change in the way LGBT youth are treated. They call to action anyone who will listen, and ask them to stand up for this cause. Using videos blogs, people combine many rhetorical strategies and reach expanding audiences. Through literary technique, tone, and context, this genre strives for a social movement. Marketers would be wise to follow the example of this successful movement. Through utilizing these techniques, marketers could create a much broader fan base. They could reach individuals anywhere around the globe. Through video blogs, companies could market their product to all types of people. They could direct specialized adds towards certain audiences, reaching groups that would have otherwise been neglected. Using the strategies embraced by the “It Gets Better” project, companies will be able to excite and inform audiences about their product. Video blogs can be directed at a wide range of audiences, but it would be most beneficial to target individuals most accustomed to video blogging. The groups that interact most with this form of media are students or school aged individuals. The younger generations are more exposed to online information. They are used to searching the web and experimenting with different types of communication. Teenagers and young adults largely embrace the popular site entitled YouTube, which consists of music videos, commercials, videos, and video blogs. Marketers would be wise to specifically target this audience. Though marketers should take into account this large community, they should try to attract others through a common goal, lifestyle, or slogan. They should consider incorporating personal, yet universal ideals to create a community among their viewers. They should incorporate a mission for their product. The “It Gets Better” campaign demonstrates how this strategy is effective. An example of how this works is the success of the “It Gets Better” project. The “It Gets Better” project is a widespread mission that incorporates anyone who believes in the respect of all individuals, regardless of sexual orientation. A massive amount of people are involved in this internet-based project, including many lesbian, gay, bisexual, and transgender individuals. Apart from the LGBT community, many heterosexual individuals also participate, including celebrities. Though many different types of people participate in these video blogs, they share many similar values and beliefs. The people who are part of this community believe in celebrating differences. They believe that everyone should be accepting of each other. They believe that persecuting a person due to their sexual orientation is wrong. Everyone who is part of this genre believes that bullying, especially because of orientation needs to be addressed and stopped. President Barack Obama said in an "It Gets Better" video, “We have to dispel this myth that bullying is just a normal right of passage, that it’s some inevitable part of growing up. It’s not”. Finally, they believe that through these weblogs, they can help LGBT youth. On the “It Gets Better” website the pledge reads, “Everyone deserves to be respected for who they are. I pledge to spread this message to my friends, family and neighbors. I’ll speak up against hate and intolerance whenever I see it, at school and at work. I’ll provide hope for lesbian, gay, bisexual, transgender and other bullied teens by letting them know that it gets better” (Savage). The “It Gets Better” project has the capability to reach many more individuals than originally intended. The intended audiences for this genre are individuals that are part of the LGBT community, or people who have family member or friends that are part of that community. But it can also include those who believe that discriminating against others due to their sexual orientation is wrong. Anyone who has experienced bullying, seen bullying, or simply disagrees with bullying is also likely to participate. People of all different ages, races, sexual orientation and economic status are part of this movement. People from all over the world and from different backgrounds also participate. The people who are part of this project may be different in every way, but share at least one important similarity. All of these people agree that discrimination against LGBT youth needs to be addressed. They want to help LGBT youth realize that regardless of how bleak life may be, they have support and endless reasons to keep living. They want to prevent LGBT youth from committing suicide. The goal of this project is to get as many people involved as possible. Anyone who believes in these values is accepted and encouraged to participate. People who are excluded from this genre are those who believe that anyone who is not heterosexual is wrong or flawed. Anyone who persecutes others due to their sexual orientation, or anyone who disagrees with the main goal and values of this project are also excluded. It is obvious that everyone who participates in this genre believes these values, because of the videos and comments that are posted on the site. Everyone who makes a video gives people hope for the future and preaches acceptance. By creating a common goal this campaign draws in many diverse types of individuals. This goal unites people and allows its target audience to expand beyond that of a stereotypical community. By adopting this technique marketers could market their product as a way of life. Their add could inspire change or acceptance. By incorporating a slogan or an overall purpose to a product, it becomes more than just a commodity. It Gets Better does this successfully even through their own marketing. It Gets Better teams up with Google to create this ad that successfully works with what their goals are but also bring the community they support into a larger audience that would help build their brand. The “It Gets Better” project has created many positive social ramifications. Because of this mission, many LGBT youth know that they are not alone in their endeavor. Dan and Terry said in their video, “However bad it is now, it gets better, and it can get great” (Dan). They have a place to go to, which gives them hope and understanding. They have a support system that spans across the globe. This project has also educated people on a serious problem. Because of this cause, people know that many LBGT youth are bullied and discriminated against. They are also informed that the suicide rate among the LBGT youth is high. By informing people of this issue, they are providing others with the opportunity to help. They are allowing people to unite against discrimination. They are giving people hope and preaching acceptance. Because of this project lives have been saved. This project pushes boundaries by openly embracing all different types of people and sexual orientations. It spreads the message that being homosexual is not a bad thing, but rather something to be proud of. It gives people hope that life can get better. It also gives everyone a chance to have a voice. Through these blogs, people can tell their story. They can help other people without even seeing them. They have a chance to give others something they might not have had themselves, someone to relate to. Someone who understands what they are going through, who can give them hope that everything will work out. Marketing a product with a purpose greater than its intended use will make it easier to sell. It will bring people together. Having an important message or goal attached to a product will encourage people to talk about it. By adopting a goal or way of life, people are able to unite. Marketers should incorporate some strategies from this campaign. Pathos is a great way to attract an audience. Incorporating personal stories has proven to be an effective way to move people. Because people connect to others through common experiences, personal stories help build a strong community. If marketers can encourage their audience to become a community their product will be much more successful. If people feel a strong connection to the product, or those advertising the product, they will tell others about it. The bigger and stronger the community around a product grows the more marketable and successful it becomes. The evolution of the Internet has given people the ability to spread knowledge and beliefs. Through digital writing, people are able to create friends and support groups without ever stepping out of their house. They are able to help people they have never met. These online communities allow people to communicate in a unique and influential way. Through common values and beliefs, these people are able to motivate others. They are able to save lives. Through the use of pathos, “It Gets Better” is able to draw in an entire community of support. Through the exchange of videos and comments, the “It Gets Better” project unites people. If marketers can turn a product into an idea or a way of life, they will have a successful product. Designer clothes or purses are not about the actual item but rather about the name. It is more about what the name brand of the item does or portrays, than what the actual purchase does. The Internet is a great way to market an item in this manner. Through video blogs a product can be portrayed as a lifestyle or a common goal. This technology allows marketers the ability to reach a large audience in a personal way. It also allows them to portray their product in many different ways. 1. It Gets Better Project. 2010. Savage Love, LLC. 8 Oct. 2012. <http://www.itgetsbetter.org/>. Gets Better” 8 Oct. 2010. < https://www.youtube.com/watch?v=7IcVyvg2Qlo>. Sketchbooks.” Hampton Press, Inc. 2002. 8 Oct. 2012. < https://www.youtube.com/watch?v=geyAFbSDPVk>.